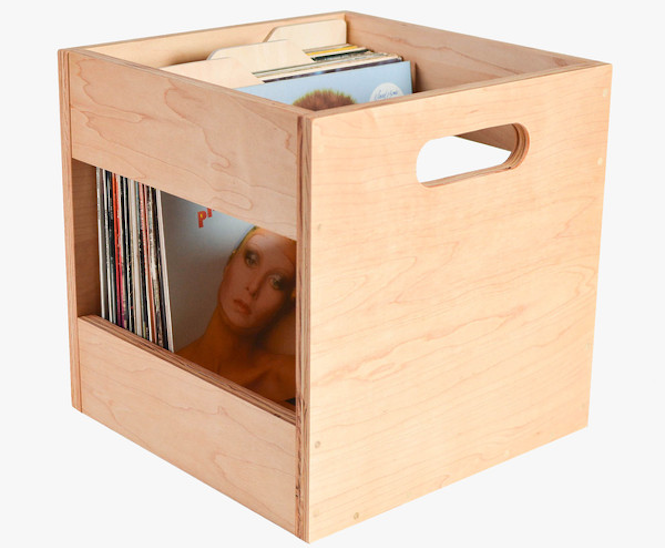 The only record crate buying guide you will ever need. 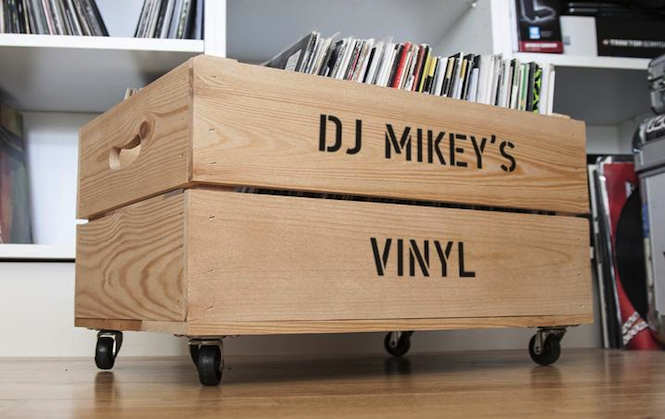 Record shelves are one thing, but for flexibility, transportation and easy access, nothing beats a good old crate. Sure it’s now illegal to repurpose real milk crates but that shouldn’t stop you being resourceful. While apple boxes and wine cases should not be overlooked, there are more and more custom options available out there that will make digging through your own collection a joy every time. Whether you’re looking for boxes for storin’, crates for wheelin’ or slings for hangin’ loose, we’ve rounded up ten cuboid containers from across a range of price points (beware the odd one out) intended primarily for use in the home. Check them out below and look out for next month’s feature on the best record bags and cases for taking your vinyl on the road. Maybe you’re moving house. 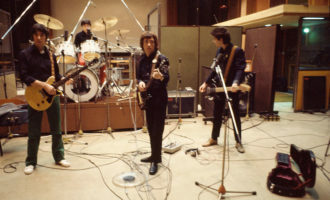 Maybe you need to clear some space (for things other than records). 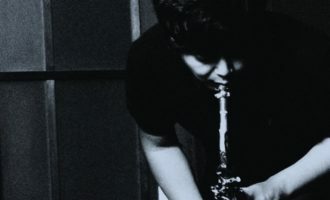 Or maybe you just love that archival aesthetic. 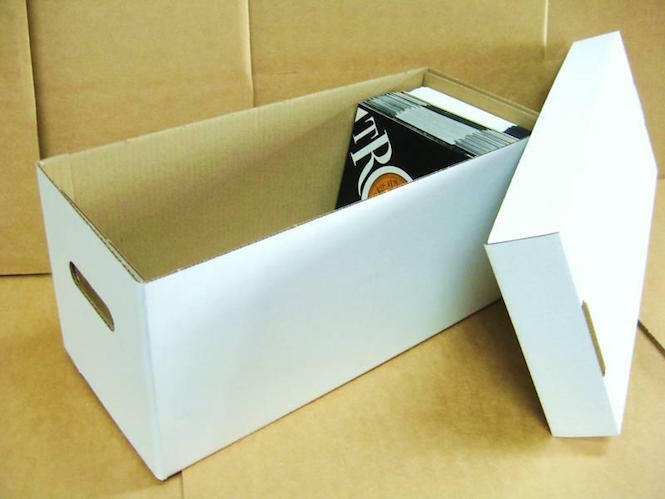 Whatever the reason, you may just want a cardboard box for your records. 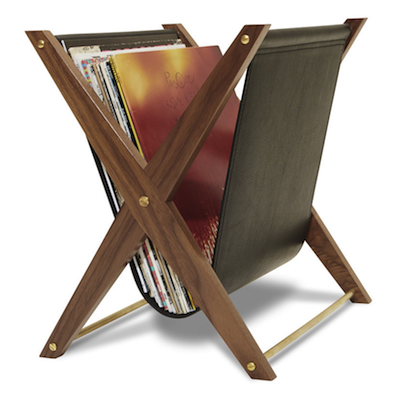 Stackable with grab handles, the 7″ boxes hold up to 220 records each and the 12″ ones take 70. 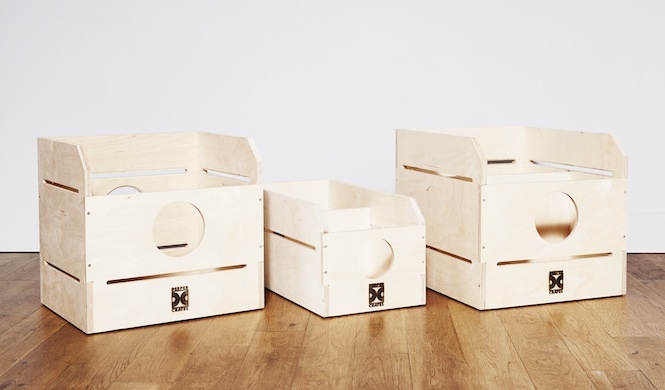 Authentic milk crates are study, portable, customisable and conveniently sized for a 12″. They’re also illegal. Avoid jail with the ultra practical Supreme Crate. 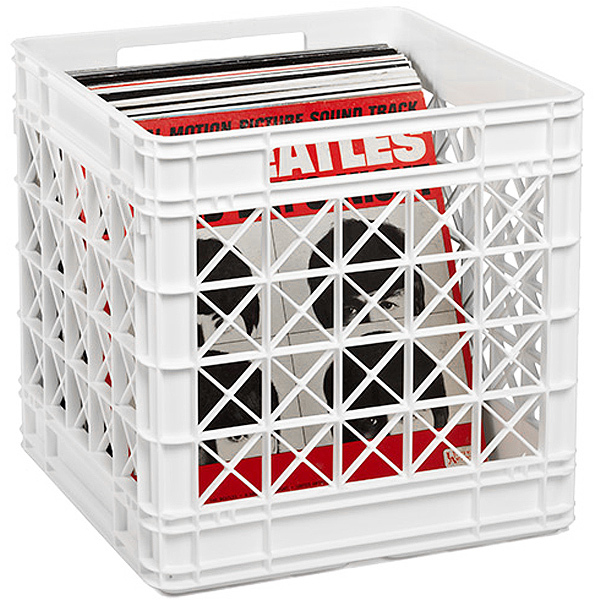 Available in black or white, these crates come equipped with tabs and grooves so multiples can be securely stacked sideways. 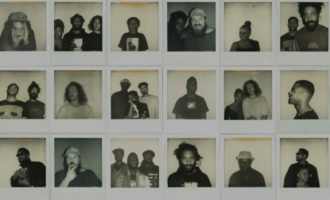 Stones Throw know how to treat their own. 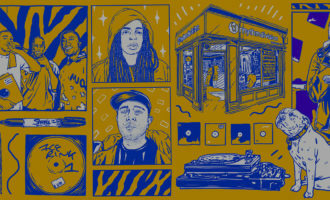 For a label so deeply embedded in LA’s hip hop and crate digging scene, a custom 7”s crate seems like a no brainer. This 6-ply alder crate is the result, capable of holding about 80 7”s in your home or on the go. 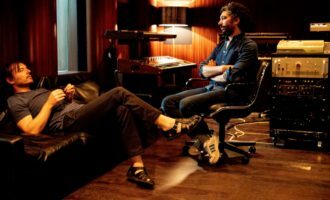 Madlib’s probably got one, so you should too. OK, so these might not work so well if you’re house is carpeted, or you’re keen on real-fur rugs (but then why would you store your records there you animal? 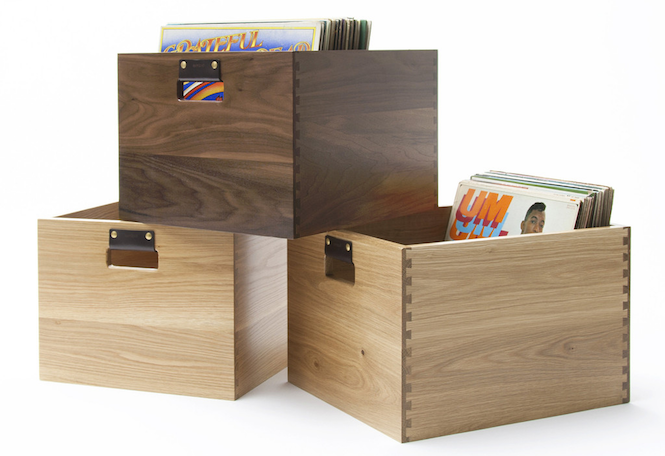 Just think of the dust), but at just £34.95 these rolling record crates are a bargain for the mobile among you. 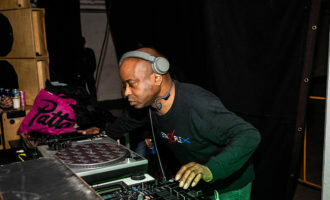 Turntables in different rooms? Easy. Hyperactive kids? This crate doubles as a fun new go-kart. And what’s more you can get it personalized with a witty message of your own choosing. 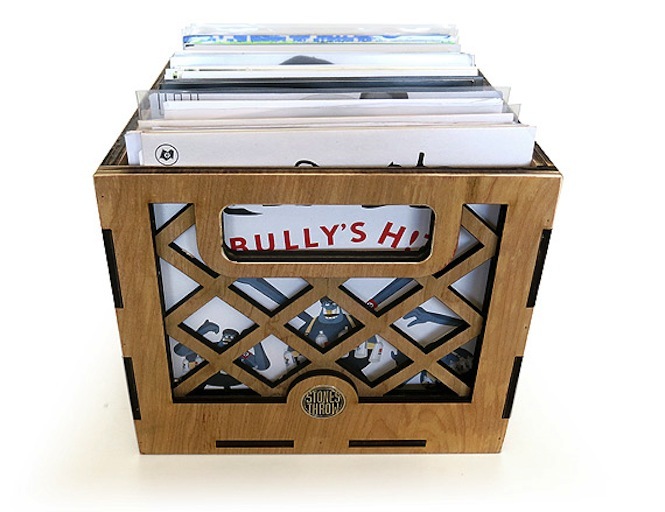 More than just a record crate, Deeper Crates bolt together like an elaborate game of vinyl storage Meccano, allowing you to create sprawling shelf space out of your boxes. Hand-made at the home of Funktion One, they come in 7” and two 12” sizes for 130, 110 and 85 records respectively, and while assembling a full unit involves time and investment, the single birch-plywood crates are both reasonably priced and readily available. 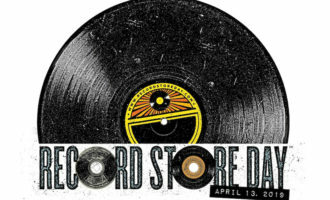 At its ‘70s peak, there were over 45 Peaches record stores across America. Inspired by California’s sunny fruit groves, the stores used to sell LP crates that looked like old peach crates. 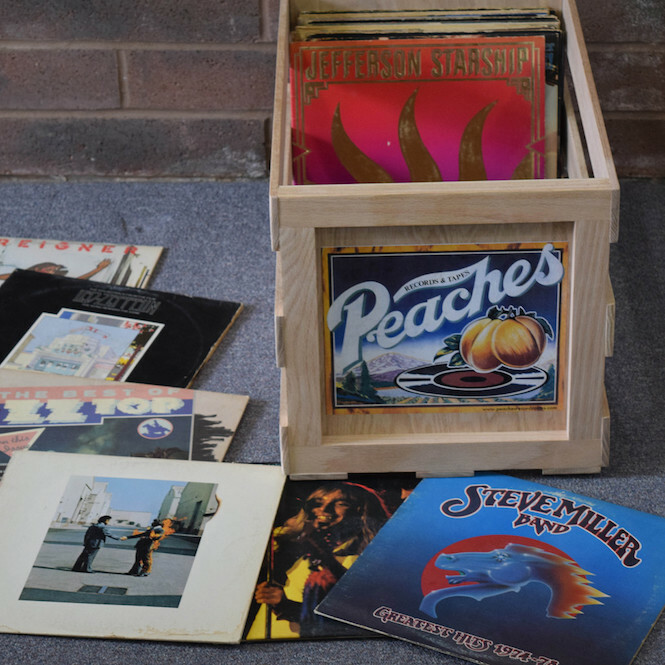 An icon of that era, these classic crates are still available to buy via Peaches. On offer in rough cut pine, smooth finish pine or furniture quality oak, they’re stackable and ready to be used as side-loaders if you prefer. 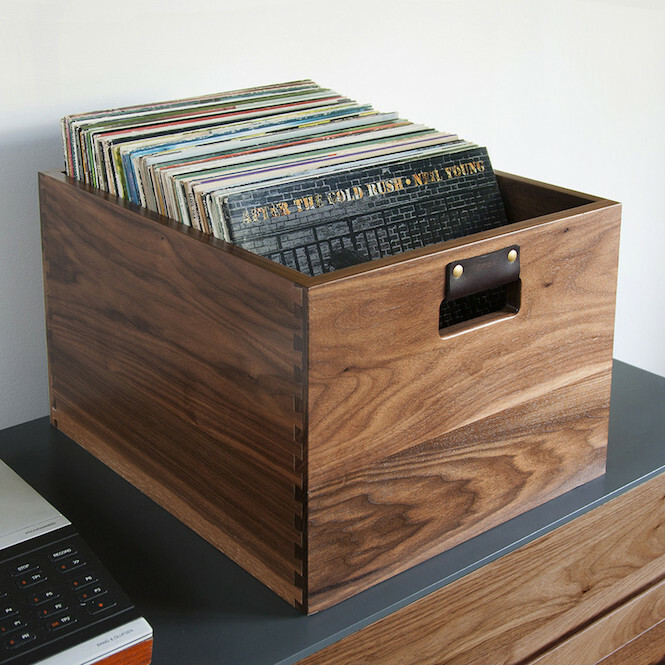 Whether storing new finds or favourite titles in rotation, these Airwood crates are a solid bet. They’re all modular, with a cube-shaped design that allows for easy stacking in a number of crate and/or bookshelf orientations. We particular like the ‘Deep Groove’ crate which has a deeper inner dimension for added protection, plus the option for divider cards. 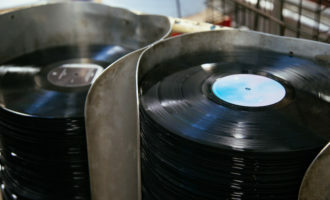 Each crate holds up to 70 records. 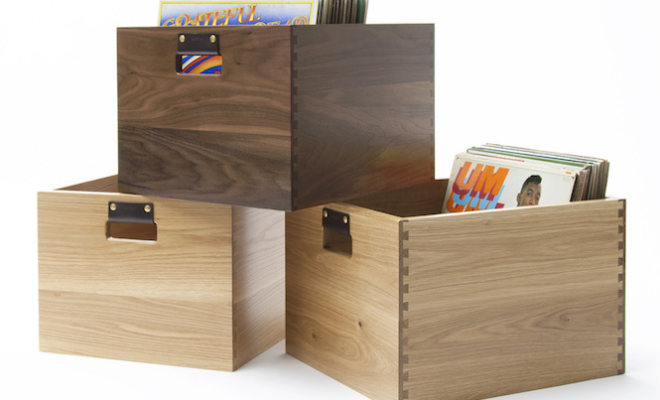 Introducing Dovetail, the Rolls Royce of record crates. Handcrafted from thick locally sourced solid walnut or white oak, each crates features leather handles for both comfort and elegance. You’ll also notice the exposed English dovetail joinery. If you’ve got dollar to drop, this is the crate for you.